As social policy, the ACA is a qualified failure. The expansion of Medicaid and mandates for individuals to buy subsidized private insurance will expand health insurance to an additional 30 million people. Regulations establishing minimum standards for coverage and barring exclusions for pre-existing conditions will improve coverage for many. On the other hand, by maintaining the existing system of for-profit medicine and private insurance, the ACA does little to rein in out-of-control cost growth while leaving millions without coverage. We can hope that the ACA’s strengths and its failures will soon pave the way for a rational universal system such as single payer health care. Not Everyone Will Be Insured: While the ACA will provide health insurance to millions of Americans, millions of others will remain uninsured. While over 25 million will gain coverage either through the expansion of Medicaid or by buying subsidized private insurance, somewhat more will remain without coverage. Some are not covered by the act (including undocumented immigrants); others will be excused from the requirement to have insurance because of cost; and others will not comply (see Figure 1). Problems of People with Insurance Will Remain: Because it builds on the existing private health-insurance system, the ACA does little to reduce access problems for people with health insurance. Those with insurance have dramatically fewer problems accessing health care (including seeing doctors, arranging follow-up visits, and filling prescriptions) than those without. But even insured Americans are twice as likely as citizens of countries with public insurance to have trouble getting care (see Figue 2). States Rejecting Medicaid Expansion and Exchanges Are Lowering Enrollment: The ACA’s Medicaid expansion would cover everyone with incomes up to 133% of the federal poverty level. Half the states, all with Republican governors, rejected expansion, denying coverage to 7.5 million people. States can establish “health exchanges” for people to choose a health plan and sign up for federal subsidies. Republicans refused to establish exchanges in 34 states. 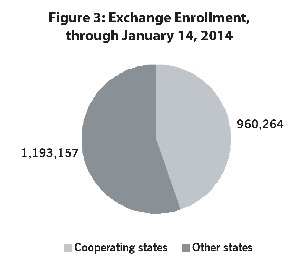 After a slow start, enrollment has picked up states with their own exchanges. Problems with the federal website slowed errollment elsewhere, though it has recently surged as well. Including those newly covered by the Medicaid expansion, the ACA has now extended coverage to about 4% of the uninsured in non-cooperating states, compared to over 15% of those in the cooperating states. If the proportion enrolling were the same in the non-cooperating states as in states with their own websites, an additional 4 million Americans would now have health insurance (see Figure 3). The ACA Is Highly Redistributive: The ACA will reduce out-of-pocket spending on uncovered expenses, deductibles, and copayments. Federal subsidies will reduce premiums while coverage expansion will lower reduce hospital surcharges for the uninsured. Public spending will increase, on Medicaid and subsidies; expenditures paid for with other savings taxes on expensive insurance plans, and increases in the Medicare payroll tax for high-income individuals. 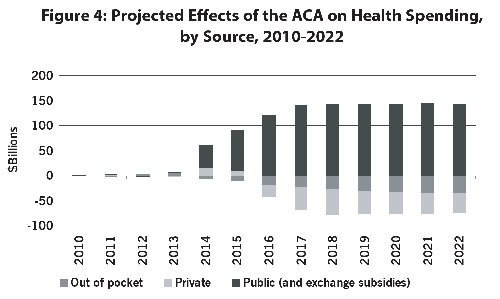 Taxing the rich to provide health care for the working poor, the ACA is the largest redistributive program enacted since the 1960s (see Figure 4). The ACA Does Not Control Costs; Single-Payer Would: The ACA does not establish a sustainable health-care finance system in the United States. 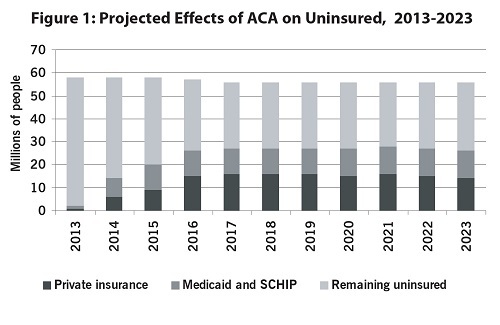 Under the ACA, health care spending will continue to increase significantly faster than the economy as a whole and the share of the economy going towards health care will rise in the next decade to nearly 20%. 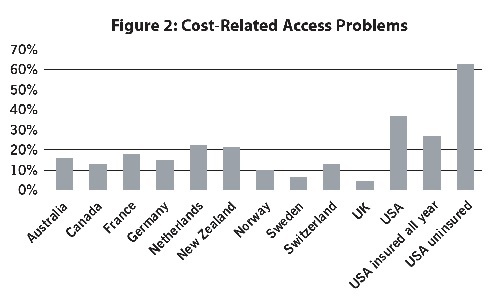 By controlling administrative costs and drug prices, a single-payer system can hold healthcare spending to less than 17% of the GDP (see Figure 5).